My favorite form of dance has always been ballet. There is incredible depth to the art form that is ballet. It has the capability to eloquently communicate a complex story by using movements and steps that appear to be so simple, yet are so difficult to master that it takes years of training and dedication that most are not willing to endure. Loving dance the way that I do, it is not surprising that it would be the subject of a Treasury that I put together on Etsy recently entitled Dancing in the Light. The treasury included items that celebrated or demonstrated various expressions of dance. While putting it together, I discovered a beautiful painting by Tricia Walsh entitled Tying Her Ribbons at Midnight. This painting captures the gracefulness of the young dancer as she bends to tie her ribbons in the glow of light from an unseen source. 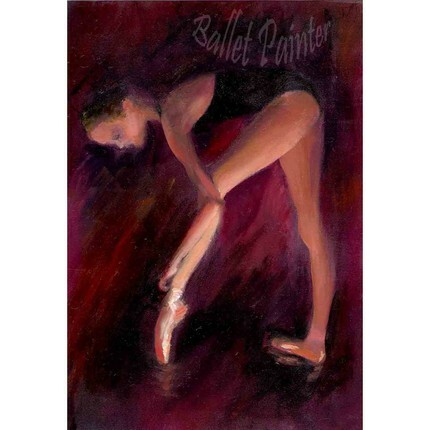 The artist uses the light to add an element of mystery to her subject and to capture the dichotomy that is ballet by demonstrating the physically demanding stretch of the dancer’s right leg and foot as she bends with elegance and ease to tie the ribbon of her pointe shoe. I am struck by this artist’s ability to capture in her paintings, the sheer joy and love of the dance and I am excited about the opportunity to share her work with others who perhaps have not yet discovered her Ballet Painter Boutique. Her shop provides a combination of original paintings, prints and ACEOs that will accommodate almost any budget and also includes some of her beautiful wildlife paintings. Pointe Shoes Aren’t for Wimps: “Years of study, exercise, and ankle strengthening were required before taking my daughter to buy her first pair of pointe shoes. The first time I saw her rise up confidently on her toes was unforgettable for me. The lines and extension of her body reminded me of a tall willowy tree. And the illusion of weightlessness . . . . as an artist I was hooked. I think you will find that Tricia’s work captures the essence of the world of ballet and I hope you will visit her shop and spread the word about this very talented Etsian!